Android GridView is a ViewGroup which is used to display stuff in a two dimensional grid. GridView is scrolling if there are many items to fit on the screen. Displaying images and text in android gridview is not so difficult. There are many ways to display images in gridview layout and in this tutorial, you will learn to display images in android GridView using one of the simplest and easiest ways. Previously, I have posted a grid view tutorial where you can learn to display static text/content in android GridView and gridview with parallax android header view. You can control user interface design either from java code or from xml. I have used BaseAdapter to display images in grid view. 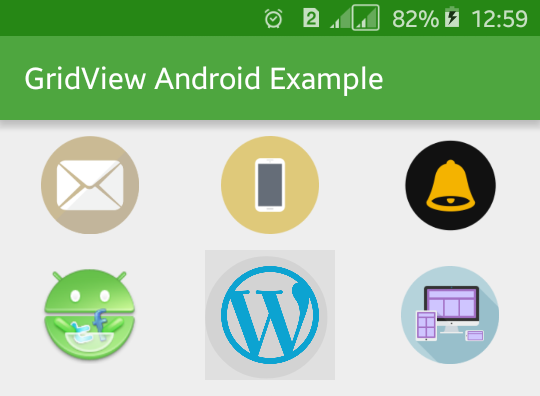 Let’s start to display images in android gridview by creating new android project with Android GridView Images project name. Following is the content of XML layout file and java activity file. Open your XML layout file and add a GridView layout with id, columnWidth, gravity, numColumn etc xml attributes. Following is the complete content of XML layout file; you can paste it to your XML layout file. Open your java activity file and add a new adapter view class to render the collection of image/data items. Following is the complete java code of java activity file. Now, run your Display Images in Android GridView application and click on any of the grid item image, you will see a toast message. This app will look like above screenshot.